It’s been an interesting year for us as we’ve moved states this past summer, planning for our home, (which Lord willing will start being built in the next couple weeks) and we’ve moved my mom from California to Colorado and are helping her get settled. So in some ways it doesn’t feel like we’re ready for Christmas, and in other ways we are WAY ahead of the season. We actually have finished ALL our Christmas shopping, wrapped ALL the presents for family and friends and they are under the tree already… BEFORE December 1st! Now THAT is a FIRST for sure in this house. Where I’m a little behind is on my December Daily. I am usually prepared and ready to go for that and have even taught classes on this in the past, but this year it wasn’t until late Saturday night that I decided to even do one. Not really for the purpose of having some beautiful scrapbook to look back on year after year, but to record our memories and take the time to be grateful for all our blessings. So late December 1st I decided to use a Traveler’s Notebook from Webster’s Pages and I simply plan to record a couple sentences each day of what we did, take photos, add some with a favorite bible verse and memory of how the Lord has blessed us at this time of year, in 2018. Anyone else planning on doing this? I look at it as just an extension of my prayer journal/devotional that I write in… but with a bit more artsy fun to it. Here’s a picture of the first day that I did on Saturday night while watching Hallmark. I’ll be posting snapshots from this journal on here and my IG, and would love to see yours as well! So if you are doing something like this leave a comment and share your IG or where we all can see it. Rebecca and I will also be posting on here throughout this month some of our favorite traditions, special devotionals and gifts that we think you will love too! So come on back through the month to see what we have to share with you. One of the traditions I’ve done over the years is picked out a Christmas ornament for each girl. That way by the time they are married and have a tree of their own, they have so many ornaments from their childhood that come with special memories as well. It’s been fun to pick one out each year that fits that time in their lives and they get to use it now and when they are married and have kids of their own. We got to ADD a little “gingerbread” girl to the tree! 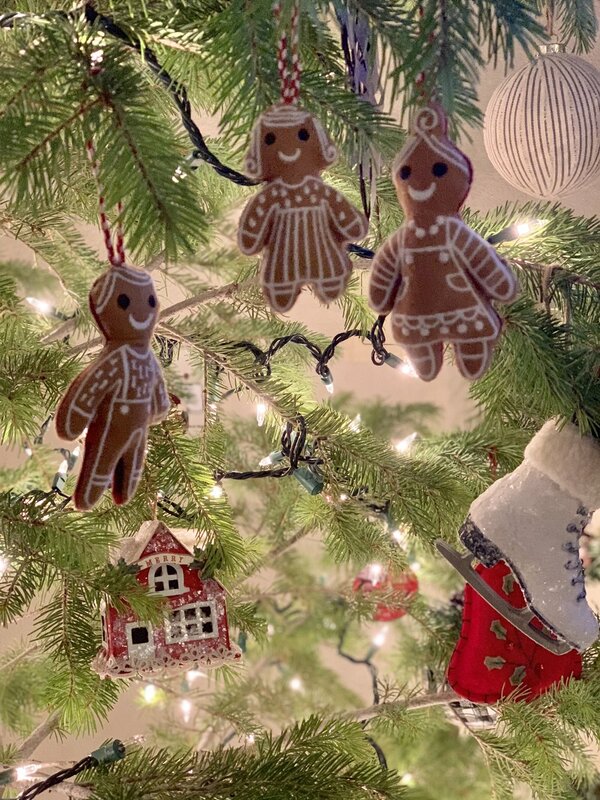 I found these adorable gingerbread people at Target and got them for our oldest and her husband who are expecting their first baby in April… and our first grand baby! Can’t wait to meet our granddaughter! That little house in the background was an ornament I made many years ago in my design days. Last weekend we were in Denver after church and went to the Tattered Bookstore by Union Station. It’s a dreamy bookstore that’s rich in history and beautifully aged. Victoria was looking through the cookbooks and came across this one. Let me just say that even though I travel to France just about every year and host retreats there, I’m not a huge fan of their cooking. BUT… this is a REAL French cookbook with simple yet amazing recipes that I can whole heartily get behind! Not the fancy duck foie gras or mushroom laden meal, we are talking the lovely croissants, and cream puffs and cheese recipes that we ALL can say YES to. We may have taken a photo of a soup recipe in this cookbook… and we may have tried it… and it may have been DELICIOUS. :) So go check this one out for the chef in your family. You’ll be doing yourself a favor as well, I promise! And for more Christmas ideas, you can go check out my oldest daughters blog as she is doing a “Blogmas” for the month of December over at Victoria Ferrara and shares about beauty, fashion and faith. And THANK YOU to all who have signed up for our Art & Faith Creative Retreat in Italy next summer! We think that is a GREAT Christmas gift as we get to meet you and share in a beautiful time in Italy with Ruth Chou Simons as we draw closer to the Lord through Art & Faith. We still have some spots open for this retreat, but we know it will sell out. So if this is something you are praying about we know the Lord will show you if this is where He wants you next June! We are so blessed by how He directs each person to our retreats as we pray for each one of you to be moved by the Lord through this time together.